Switch up your getaway plans and instead of booking a hotel, try staying on a farm for a couple of days. 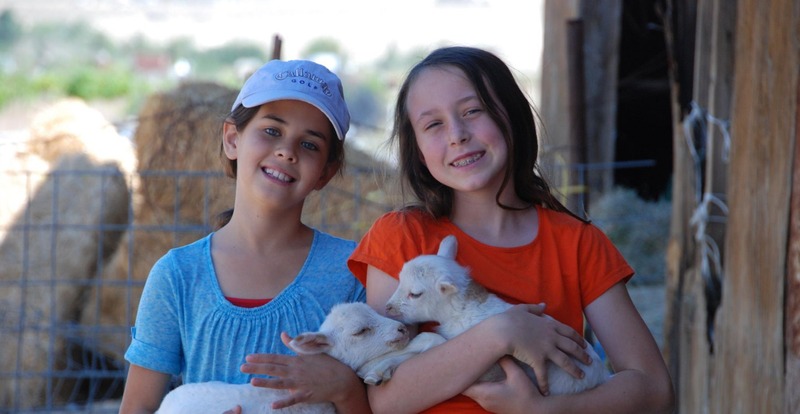 Farm stays are wonderful ways to reconnect with the land and it’s a good way to keep the kids busy; they can feed the chickens, milk the goats, or help weed the garden. Think of it as a learning experience. Rinconada Dairy is a raw sheep milk producer and starting at $175 a night, you can stay at their rustic hacienda-style ranch house, complete with a sprawling view of the coastal hills of San Luis Obispo County. There are two options: the colorful Fiesta Room ($175 a night) or the apartment ($225 a night). Wireless internet access is available, but might we suggest putting aside your gadgets for the getaway to fully take in the richness of their gardens and the spectacular 92-acre property. The kitchen is stocked with eggs from their chickens, bacon from their pigs, cheese and other baked goods. You’re also invited to join hosts Christine and Jim Maguire in the cheese-making process or help them feed the sheep and goats. Two night minimum stay is required. 4680 W. Pozo Road, Santa Margarita, CA 93453; (805) 438-5667. Flip Flop Ranch is nestled in Lucerne Valley. Dedicated to preserving heritage breeds, they raise varieties like Dorkings, Cotton Patch geese, Nigerian Dwarf goats, Guinea hogs, Australorps, Ancona ducks, and Bourbon Red Turkeys. They have quite the property; the farm house is a 3000 square foot five bedroom home. It can accommodate 15 visitors and comes with a fully equipped kitchen. Guests are welcome to feed the chickens and milk the goats. Other activities include soap-making, canning, horseback riding, and egg gathering. 9522 Donaldson Rd, Lucerne Valley, CA 92356; 760-680-6146. Just north of San Diego, The Center For Living In Harmony is a nonprofit organization with an extensive program dedicated to farm stays. They offer anything from casual weekend stays to more structured farm programs. There’s even an apprenticeship program — if you’re up for the manual labor. The property is small compared to most farms: it spans 10-acres but they have animals, a garden, an orchard, and a farmstand. Youth programs are readily available and itineraries can include ping-pong, hiking, or goat-walking. 13802 Little Creek Lane, Valley Center, CA 92082; 760-749-9634. Nate Siemens of Fat Uncle Farms has a ranch in Lompoc that has been around since 1920 and spans 100 acres, with plenty of livestock and farming projects. Their guesthouse is bookable via AirBnB and starts at $809 a week. Company is welcomed as the family milks goats, feeds the animals, collects eggs, and waters the garden. And when a breather is needed from the sweet farm life, take a hike around the property or head to one of the neighboring farms or vineyards. According to the owners, ice cream making sessions and campfires are common and might we add — awesome — occurrences. Campbell Rd, Lompoc; 661-599-2103.
Notable mentions: Mariposa Creamery in Altadena. Farm stays are currently sold out for this season. though. Windrose Farms offers seasonal camping in the orchards for $20/night. And if you’re in Washington, Quillisascut Farm is a haven. See our feature on Quillisascut here. Another nice one in San Diego County = the Morningsong Farm.